Ifûdôdô is just on the opposite side of Shigeru from RYOMA, and, being so close to my house, was close to the top of the hit list. Apparently, the name Ifûdôdô means "majestic" or "kingly," and is also the translation of "Pomp and Circumstances" in Japanese. 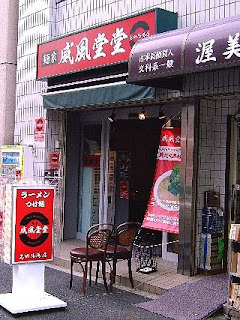 So, perhaps the name was chosen as a references to the student population, since this shop is one of the closest to the Waseda campus, though I'm not sure if that march is a standard at Japanese graduation ceremonies the way it is in the U.S.